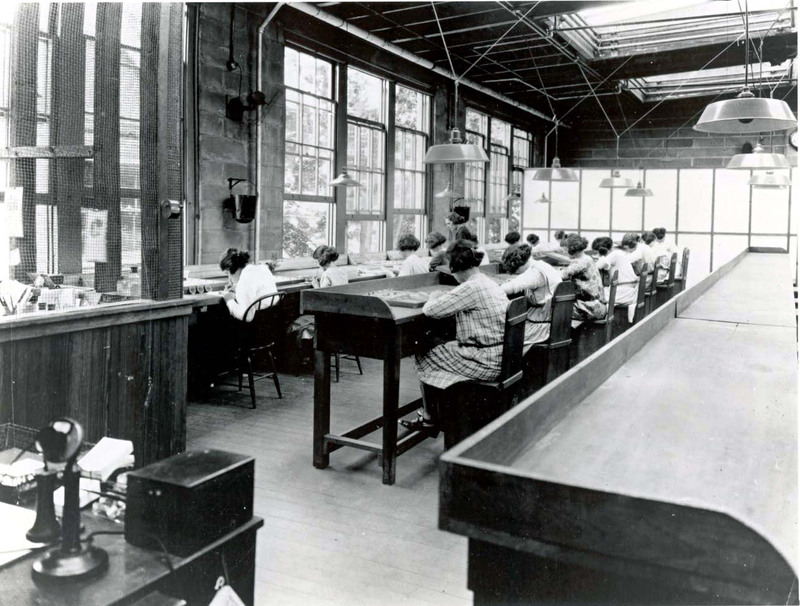 Many people know the tragic story of the “radium girls,” the luminous-dial painters of the flapper era who tipped their paintbrushes in their mouths, became sickened from internal radiation exposure, and had to fight for workers’ compensation as they died. Although a large number of radium paint factories existed, one in particular is identified with this infamous episode: the United States Radium Corporation, sited on two acres at the southwest corner of High and Alden Streets in Orange, New Jersey. This factory was built in 1917 for the combined purposes of radium extraction, purification, and paint application. 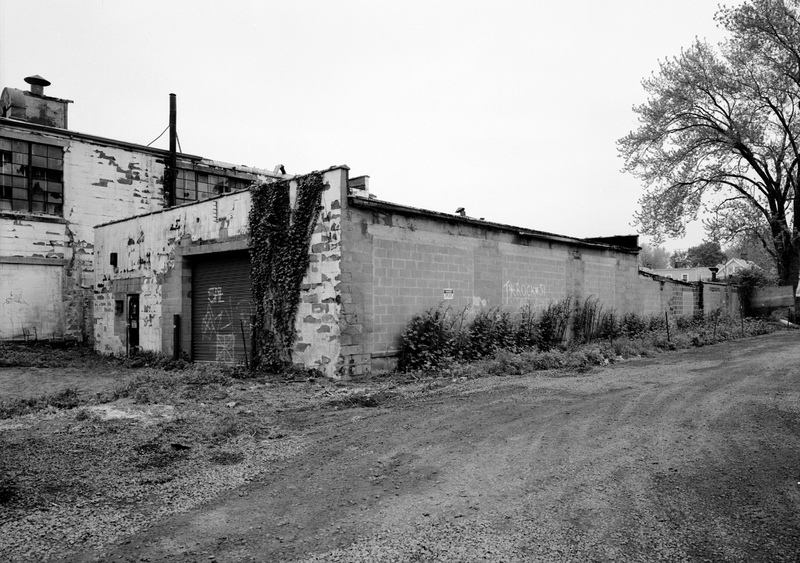 Two original buildings—including the paint application building—remained standing until the US EPA had them torn down as part of a Superfund remediation project in 1998. Today, the site is a barren, fenced-in, field with no hint of radioactivity betraying its former capacity. In this post I’ll share a few photos from my trip this month, from the Library of Congress’s archive of the recent past, and even one from the plant’s heyday. I’ll share some quotes about the technical operation of this facility, and a pic of my samples of its product, Undark. The former U.S. Radium site viewed from the southeast corner in 2012. A railroad track once paralleling the confined Wigwam Brook brought 100-lb sacks of carnotite from Paradox Valley, CO, as well as soda ash, to a siding here. Radium was extracted in a long-since-demolished building at this corner of the property before going to the crystallization lab and ultimately the paint shop on site. Hydrochloric acid, the main extractive lixiviant, was stored in a tank on the opposite side of the property. Paint Application Building, exterior: About 300 dial painters, virtually all of them young women, came to work here between the years of 1917 and 1926. 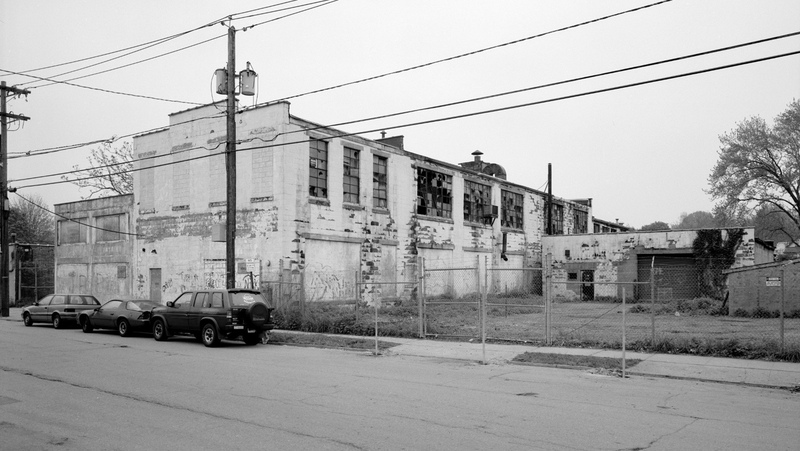 South-easterly view of U.S. Radium’s paint application building from Alden Street, mid-1990s (public-domain photo from the Library of Congress). Grace Fryer and her dial-painting cohort probably ingested their fatal doses of radium on the second floor of this building. 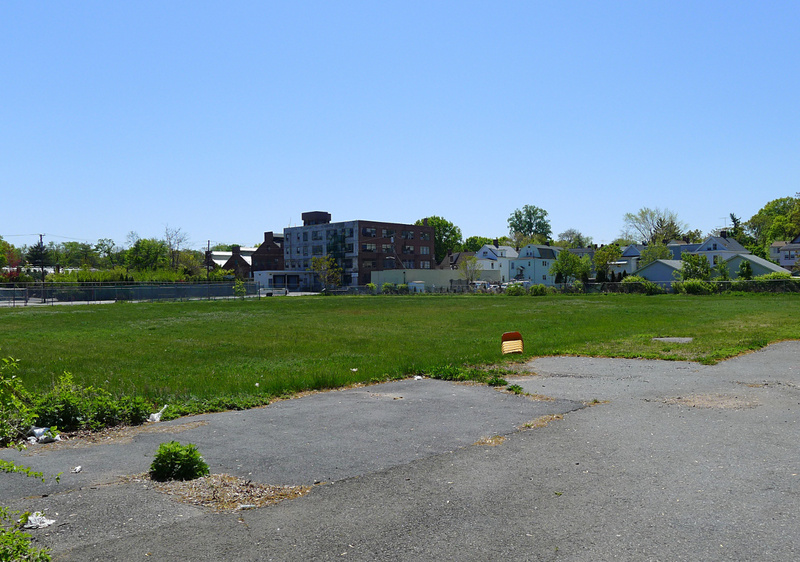 A similar view today (2012): all that’s here now is an empty field behind a fence. A scintillation counter measures nothing above background levels of gamma radiation. 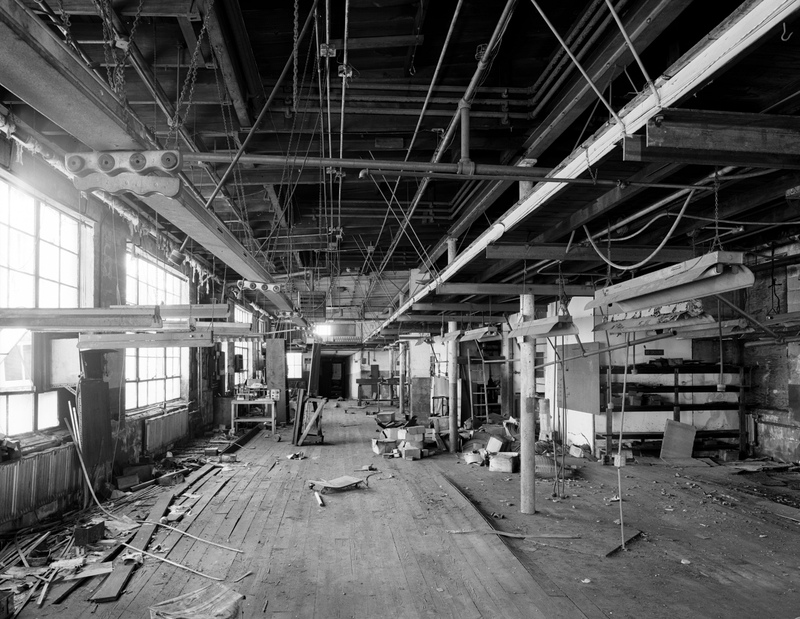 Second floor of the Paint Application Building, interior view to the southeast in this 1922 photo belonging to Argonne National Laboratory. Note the open skylights. The same room, late 1990s, Library of Congress photo. The skylights have been filled in, but their recesses and original plumbing are still visible. The floor has been replaced. The one-story crystallization lab as it looked from the northwest, in this mid-1990s Library of Congress photo. Behind it is the Paint Application Building. 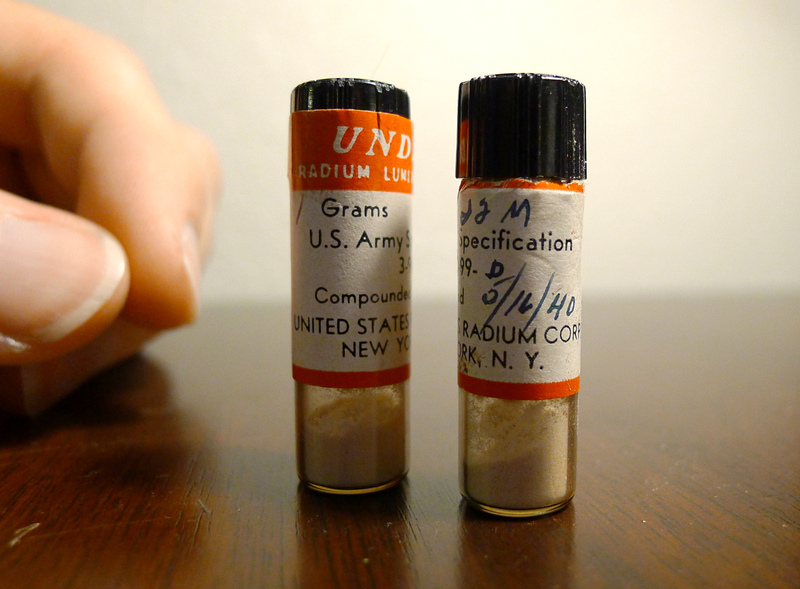 Undark, dated 1940, made to Army Specification 3-99D, packaged in 1g vials. Each produces a gamma exposure rate of about 40 mR / hour on contact, broadly consistent with about 20 microcuries of Ra-226 activity per gram. The Waste: Anything that was not radium—i.e. the vast majority of the ore that entered the plant—was waste and had to find a new home! This included the uranium content of the ore; preceding the discovery of fission, uranium was effectively worthless. 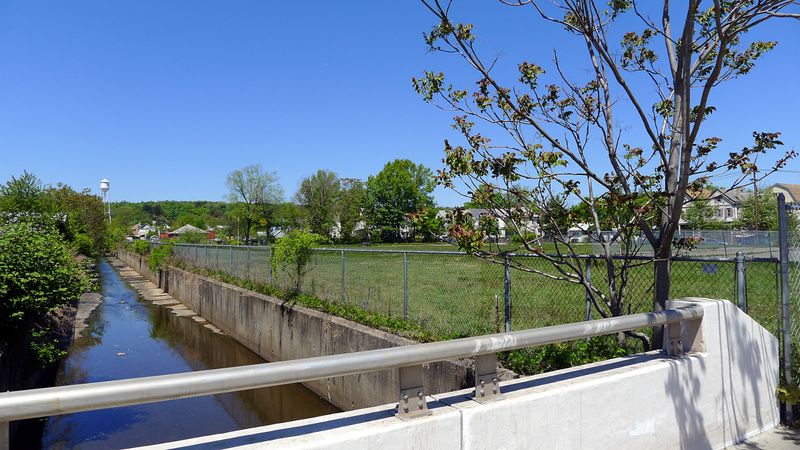 One common application for U.S. Radium tailings was infill for construction projects in nearby Glen Ridge, Montclair, and Orange. Contaminated fill was identified, dug up, and replaced throughout the 1990s. 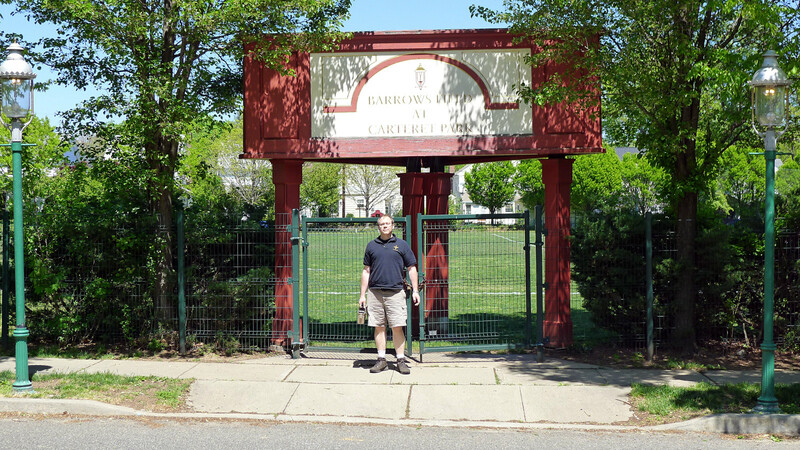 Carteret Park (e.g. Barrows Field), located in Glen Ridge, was originally filled with waste tailings from U.S. Radium. Third base was rumored to be particularly “hot.” The entire ballfield was dug up, trucked away in drums, and restored with clean fill in 1998. The hottest spots at Barrows Field today are along the concrete fence wall. 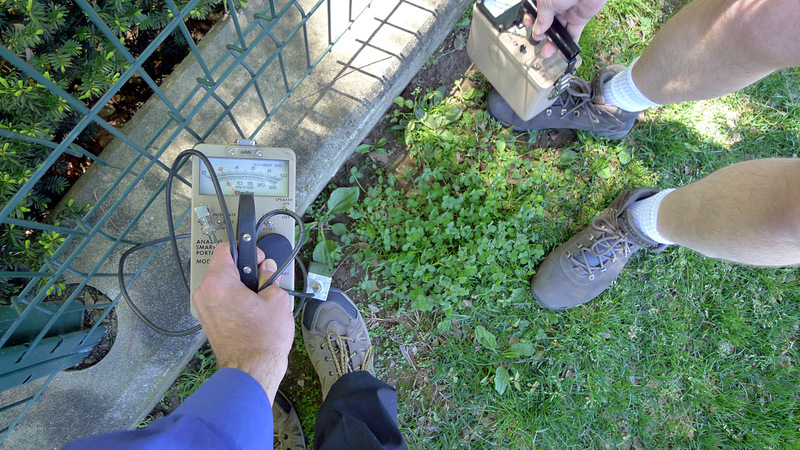 Whether the minor detected radioactivity is owing to natural occurrence in the concrete materials, or un-remediated residues from U.S. Radium, is impossible to say. Nice article Carl. I remember growing up with those watches with the hands of a watch glowing so you could see them at night. I also remember purchasing some paint that when painted on something it would glow in the night. Perhaps radium? From what I can recall they used a very small amount of radium, and mixed it in with phosphorus. The radium would stimulate the phosphorus to glow in the dark, much like exposure to bright light would, as will high voltage. Luminescent paint is still very much on the market, I don’t know if it still contains green phosphorus or not, but I doubt whether any such commercially available paint purchased from a store, since the late 1930s, would have contained actual radium. I used to be concerned about the glow in the dark dials, and hands found on vintage clock radios, but that was before I found out about how little radium the paint actually contained, and the fact that it transmutes, and breaks down over time. Can you give your readers a CPM reading of one of the vials with a common G-M tube like the Ludlum 44-9 or a 1×1 NaI scintillator? That would be helpful for those of us that have a WWII helmet marker, to estimate the microcuries in the markers. Hi Jack, the 44-9 is a pancake tube mostly sensitive to beta particles, and since betas are strongly attenuated in the source and its packaging, this wouldn’t be too meaningful a measurement unless both sources had very similar packaging. An NaI scintillator is gamma-sensitive, but the count rate depends critically on the detector’s threshold and the gain of the specific PMT at a specific operating voltage, and thus this isn’t a good comparison either. One of my vials measures 750 cpm on an energy-compensated HP-270 probe at 10″, corresponding to 0.63 milliroentgen / hr there. Using the Ra-226 equilibrium specific gamma constant, this suggests a content of 49 microcuries of Ra-226 in that vial. The Geiger measurement is within 20% of a calibrated Ludlum 9 ion chamber reading, beta window closed and centered on the same location. I still think the reading is high due to betas and bremsstrahlung and believe the vial content is closer to 20 microcuries each. The surest measurement would be a calibrated HPGe reading of a Bi-209 peak at a carefully-controlled distance, but that’s more involved than I was able to go tonight. Hope this helps some. for radiation measuring instruments, educational demonstration equipment (e.g., cloud chambers and spinthariscopes), electron tubes, lightning rods, ionization sources, static eliminators, and other approved uses. Such sources may be possessed under a general license; however, if the source strength exceeds 0.037 megabecquerels (1.0 microcurie), a specific license will be required. My possession of the Undark and other antique radioluminous sources comports with state and federal regulations as I understand them. On another note, I’m not sure why you’re posting entire sections of 10 CFR to my comments…we all know where to find these and an abbreviated citation is entirely sufficient to support whatever point you are trying to make with this stuff. I grew up a few blocks from here. My mom worked in a sequin factory (Elliot, Greene & Co.) that occupied the crystallization lab building! I had been in here many times as a kid (I’m 58 as of this righting). On the corner to the left of the main paint application building, the small one story building, was a sandwich shop back then. My mom had been examined several times over the years after the Superfund project started. She was fine. I use to play on the train tracks behind these buildings all the time. HI Carl, my father worked for US Radium and its successor, Safety Light Corp. He was a Chemical Engineer who started working with glass products in Vineland NJ, then formed a company with a friend called Tele-Ray Tube that coated TV picture tubes. After their company went out of business, he started working for US Radium/Safety Light in Bloomsburg, PA and Whippany, NJ. 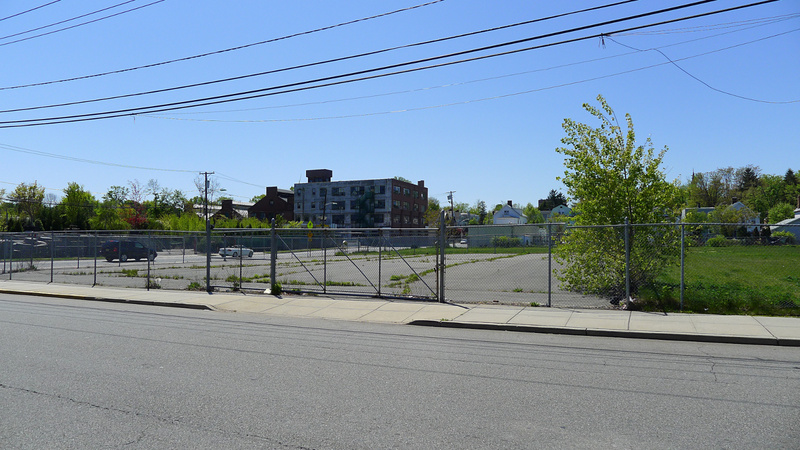 Both sites are former Superfund cleanup locations. I remember visiting the plant in Bloomsburg once with my father. We entered through the employee entrance on the side of the building and headed toward the kilns. After only about one minute in the building, I ran for the exit because I could not breathe. He brought me in through the main entrance and I could go no farther than his office. We had a variety of items around our house in NJ from my Dad’s work: glow-in-the-dark aircraft dials, an household air ionizer, and small metal cylinders with glass bulbs on top that contained phosphorescent dust that I was told were used in large highway signs. None of the artifacts survive to this day, and my father passed away in the late 70s. Tests showed he had multiple forms of cancer, not surprisingly. What U S Radiumdid was sinful.